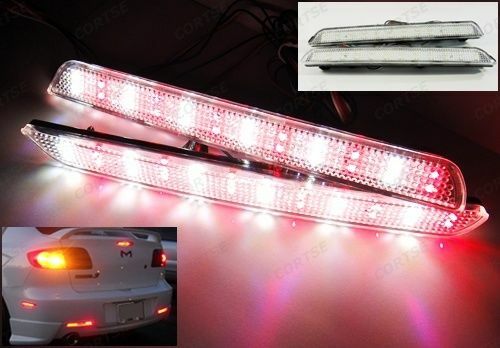 I have white/red LED reflector strips (picture below), and I'm thinking of using the white portion as turn signal lamps. So I'm wondering - is there anything in the books that prohibit white rear turn signal lamps (working in conjunction with the stock ones)? I cannot find anything in the HTA. Brake lights must be red or amber, headlights must be white or amber, but nothing in regards to turn signals. I saw this thread in which a guy was given a ticket for white turn signal lamps and the ticket cited HTA 142(8), which is actually about brake lights. Could one get a ticket thrown out for that? (2) The driver or operator of a vehicle parked or stopped on the highway before setting the vehicle in motion shall first see that the movement can be made in safety, and, if in turning the vehicle the operation of any other vehicle may be affected by the movement, shall give a signal plainly visible to the driver or operator of the other vehicle of the intention to make the movement. R.S.O. 1990, c. H.8, s. 142 (2). (3) The signal required in subsections (1) and (2) shall be given either by means of the hand and arm in the manner herein specified or by a mechanical or electrical signal device as described in subsection (6). R.S.O. 1990, c. H.8, s. 142 (3). (b) to the right, by extending the hand and arm upward and beyond the left side of the vehicle. R.S.O. 1990, c. H.8, s. 142 (4). (5) Despite clause (4) (b), a person on a bicycle may indicate the intention to turn to the right by extending the right hand and arm horizontally and beyond the right side of the bicycle. R.S.O. 1990, c. H.8, s. 142 (5). (6) A mechanical or electrical signal device shall clearly indicate the intention to turn, shall be visible and understandable during day-time and night-time from the front and from the rear of the vehicle for a distance of 30 metres, and shall be self-illuminated when used at any time from one-half hour after sunset to one-half hour before sunrise. R.S.O. 1990, c. H.8, s. 142 (6). (7) No person while operating or in control of a vehicle upon a highway shall actuate the mechanical or electrical device referred to in subsection (6) for any purpose other than to indicate a movement referred to in subsection (1) or (2). R.S.O. 1990, c. H.8, s. 142 (7). (b) by means of a stop lamp or lamps on the rear of the vehicle which shall emit a red or amber light and which shall be actuated upon application of the service or foot brake and which may or may not be incorporated with one or more rear lamps. R.S.O. 1990, c. H.8, s. 142 (8).